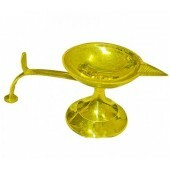 This Artistic Samai oil lamp for every pooja can lit five wicks together and has a holder in the center. Its religious appeal makes for every altar to invoke the divine blessings. 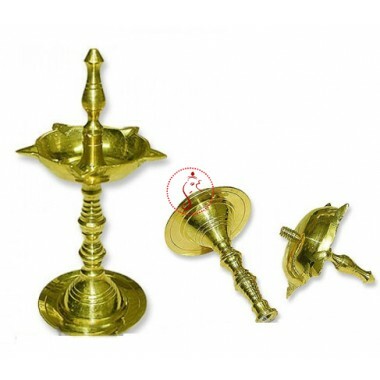 During the Aarti, the lamp is lit and is rotated in clockwise direction as a sign of invoking the energies of the deities. After the completion of Aarti, all devotees take the blessings from agni god. 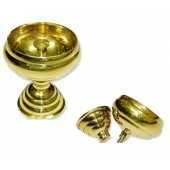 Design: Made of thick brass with long lasting finish. Artistic carving and fine finish. Single wick (Eka Mukha Deepam) for normal benefit. Two wicks (Dwimukha deepam) brings harmony and peace in the family and relatives. Three wicks (Trimukha Deepam) Blesses with progeny. 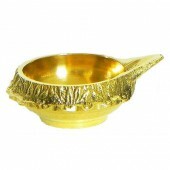 Four wicks (Chathurmukha deepam) brings allround prosperity and Sumptuous food. 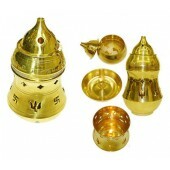 Five wicks (Panchamkukha deepam) showers akhanda aishwaryam or Wealth. Six wicks (Shanmukha deepam) blesses with Akhanda Gyana (Knowledge) & Vairagyam (Renunciation).